Since Valentine’s Day on 2011, the state of Ohio has been trying to successfully enact a heartbeat ban — a bill that would ban virtually all abortions in the state by making it illegal to perform a termination after a heartbeat can be detected, or about two weeks after a missed period. Ohio was the first to introduce this bill, and nearly eight years later anti-abortion activists still haven’t been able to successfully get it signed into law. But that will probably change this legislative session, now that a new Republican governor is at the helm. Unlike his GOP predecessor John Kasich, Governor Mike DeWine has repeatedly promised that he will sign the bill when it reaches his desk. If true, this will be just one of many states trying to bring heartbeat bans to their governors for signature — with some looking far more likely to succeed than others. North Dakota, Arkansas and Iowa already managed to pass and sign heartbeat bills — though not a single one of those bills was ever allowed to go into effect. All three states saw their laws blocked before they could be implemented, with state and federal courts arguing that the bills are — rightfully — an unconstitutional infringement on a pregnant person’s right to obtain an abortion. This includes Arkansas, which hoped to avoid that legal designation by placing their ban at 12 weeks instead of the approximately six weeks post-last menstrual period that the other more traditional heartbeat bans advanced. As of yet, no court has ever found a heartbeat ban in any form constitutional — and that ruling was again reaffirmed in Iowa less than two weeks ago. With the courts so adamant that they will not allow states to ban abortions just days after a person may have realized they were pregnant, you’d think that states would simply stop trying to introduce this obviously unconstitutional bill. Instead, however, the effort seems to be picking up steam. There are now at least four other states introducing heartbeat bills this legislative session. They’ll join South Carolina, which announced late in 2018 that it will try to pass a ban as well. Minnesota is introducing such a bill – one that’s unlikely to ever be signed into law, much less end up seeing any sort of court action. While the state legislature is almost evenly divided on the abortion issue, the newly elected Democratic Governor Tim Walz is strongly pro-abortion rights — and, like his predecessor, won’t sign any abortion restrictions into law. That’s sadly not the case in the other states considering similar bills. Tennessee is fresh off of a ballot amendment court battle, and now the state will likely test out that ruling if their newly proposed heartbeat ban passes. With a 48-hour waiting period, two required in-person clinic visits and an already volatile landscape of unreliably open clinics, it would be nearly impossible to get in for an abortion in time to beat the gestation limits of the ban. Meanwhile, Missouri is also proposing a heartbeat bill. The state has just one clinic remaining to offer patient care to those seeking an abortion. Plus, the state’s waiting period is a mandatory 72 hours after the initial in-person appointment. When a person has less than 14 days to terminate, there’s simply no way they can manage to add three more waiting days into the mix. In both cases, if a heartbeat ban is allowed to go into effect, it will essentially end legal abortion in each state. Then there’s Florida, which is introducing its own bill as well. Like the other states, passing and signing it into law means abortion would be impossible for Florida residents to access in their own state. But this bill would also have major impact on those who travel to Florida from neighboring states because it is too difficult to get abortion care in their own states. Florida is surrounded by low clinic access states — like Alabama, Mississippi and Louisiana. And even though Georgia has many clinics, almost all are located in the northern half of the state. Florida is also the only state in the South where abortion can be performed after 20 weeks, so a heartbeat ban here would have a grave impact on those who may discover fetal anomalies or have issues later in pregnancy. And unfortunately, it looks like this bill could well pass. The state has a red legislature and a new Republican governor eager to see the bill on his desk. While the Florida Supreme Court has upheld the right to an abortion in the past, the court has become far more conservative due to a number of recent turnovers. For once, we may see a court uphold the ban — and it could even make its way to the Supreme Court. In 2011, a heartbeat ban was considered a fringe idea that divided the pro-life movement, with moderates fighting against them out of fear that they could inadvertently uphold and reinforce Roe. Now, they are a commonplace bill — and lawmakers are tripping over each other in a rush to introduce them. 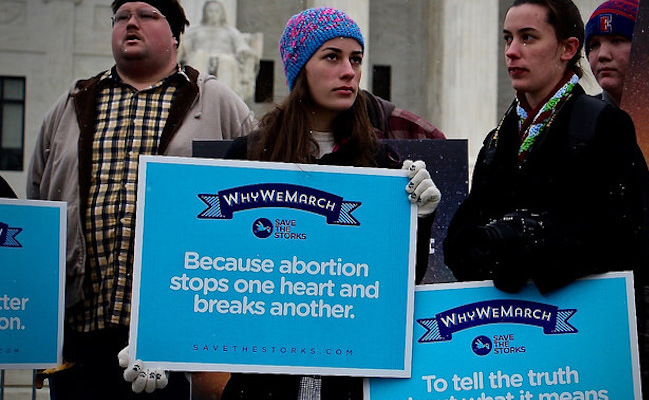 That itself is the clearest sign yet that Roe v. Wade – and a federal right to a legal abortion — is about to disappear for good. @past member--"Stop donating for causes for children to save them from starvation and cancer, just let them die." That's exactly what people like you do, after the child is born, your faux love and concern stops dead, except to then take away every possible thing to make that child's life better and healthier---Your love is only for the complete control of women and little girls bodies. @Yes Past Member--go to another site, there are plenty of hate sites against women, and every ethnic group they can think of to blame everything on, like spoiled rotten little brats do. People like you/Republicans hate children and there is actual proof of what I say. Policies taking most everything away from poor children, as soon as the child is forced born, you cowards run and then change your hate message to blaming women who have these babies. Your posts are often disgusting like the one I just reported about "killing American children ESPECIALLY BLAXCK â¦.. "
If you don't have anything decent to say, maybe you need to find an alternative site to post on. One that espouses your hate. Evil Republican men (and some women) will do anything to destroy women's rights. The midterm election seems to show it is not going to stay that way. I respect your heart-felt defence of the unborn foetus, but you do seem to be confused as to what abortion is. ' Full term, partial birth and post birth' you say, but these are not abortion issues, they are quite different. If the foetus is consciously sentient and viable of course removing it from the womb is a big problem but if those two parametres aren't met then what's the problem? You really do need to imagine what it's like for a woman to carry through a pregnancy knowing that what is growing inside her has serious defects, or that her health is in jeopardy if she carries the pregnancy to term, or that she has such serious socio-economic or psychological problems that she will not be able to bring the child up. It really does have to be the woman to decide what she can and cannot face with a pregnancy and men's high-sounding principles are actually irrelevant. @Paul B--You are a piece of work! How about telling the truth and stop spreading these preposterous lies about abortion. Why do you think you are better equipped to decide if women can have an abortion, or not, instead of her, or her and her Doctor? Who do you think you are? Since you think forcing a woman to have a child is your right, whether she wants to, or can't, because of health problems, give birth. I think you and all forced birthers, should be financially responsible for that forced birth child, pay all hospital bills, no matter if the child is mentally or physically disabled for life. You should be responsible for its whole life. There, problem solved! Now you can put your money, your Religion and your righteousness, right where your great big, none of your business, mouths are!! I know very well, your minds would be miraculously changed! You want to interfere in peoples lives, treat them like slaves, then expect consequences. Anne M....''heartbeat=life"? Are you serious? Do you honestly think that a genetically programmed muscle means ''life'' at six weeks? Do you think that fetus (smaller than you'd ever imagine) could ''live'' on its own? Compare that, please, to the genuine ''life'' of an adult, sentient woman...who may have other children or responsibilities far beyond anything you could imagine. If you think that's ''life''...will you suggest a funeral service? Gravesite?